After months of hearing great things about Pure Milk Centre, decided to land here with sister and friends, one of whom was giving his birthday treat. Situated at Vikrant Circle which is probably the only happening place in Ghatkopar East area, it was packed to the brim on Sunday evening with a waiting time of 20 minutes. The 6 of us were just whetting our appetite looking at all the happy young faces around. Big Mistake. After 15 minutes, we got a table in the indoor AC section. Small place with indoor and outdoor seating, indoor is just a little bit more expensive than outer. But since it was a birthday party, we splurged. Very polite staff. Very fast service. On the table, we had the normal menu as well as a photo menu showing delicious pics of many items from their menu. Prices seemed a bit excessive. Menu has hundreds of dishes, mostly they are variants of dosas, sandwiches, rolls, chaats. -- SAMOSA CHAAT - The only item we all truly enjoyed. Generous portion, it was enough to feed 2-3 hungry souls. Loads of samosas, sevv, dahi, good balance of tangy,sweet,sour chutneys. Too good. -- PANEER PASTA GRILLED SANDWICH - Oh God, we were in trouble the moment we looked at the size of this. It was HUGE! And on top of it, loaded with CHEESE! Cheese inside, cheese outside, oozing everywhere. 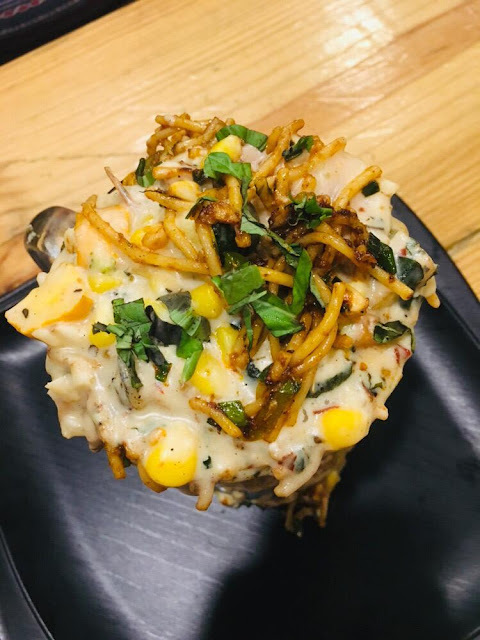 Good taste of soft paneer and pasta coming through but we were done in 2 bites. 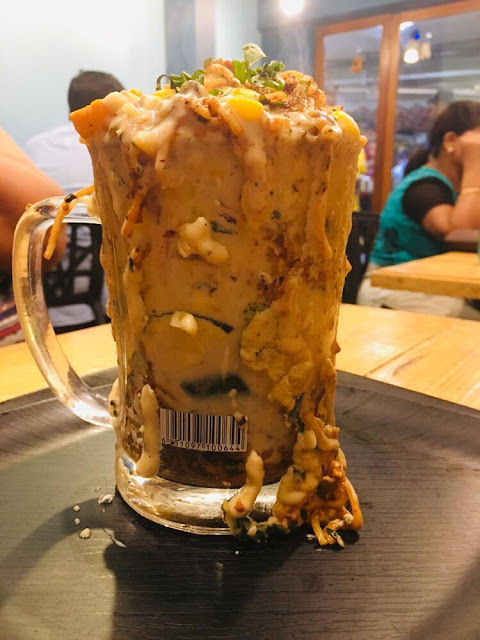 -- MUGGA LAYERS - We asked the staff what it was and we were told it is a big mug full of layers of cheese, grilled exotic veggies such as carrots, broccoli, bell peppers, another layer of pasta, another layer of noodles and masala. Sounded interesting. It does come looking just as described. Just its size is enough to give a heart attack to anyone. Easily can feed 4 hungry people. Again, cheese cheese and more cheese. 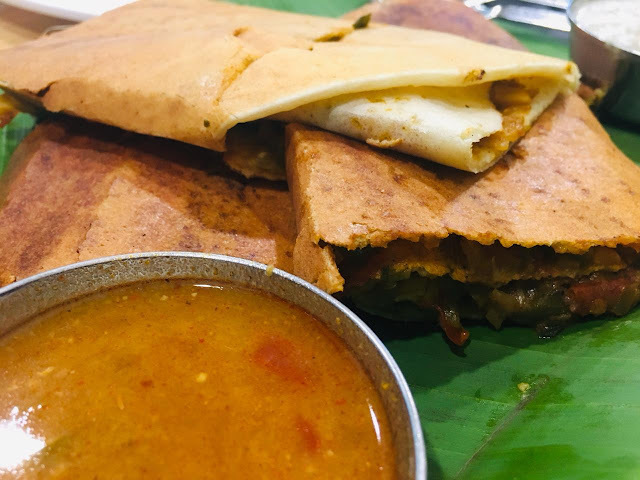 -- MYSORE MASALA DOSA - Finally we decided we had enough of all the cheese. So we browsed through the menu to find something with no cheese, it was very difficult but we zeroed down on our humble dosa. When it arrived, it looked good. And then, disaster. Anybody who has ever been to an udipi knows what mysore masala tastes like. Here the masala was simply the veggies mash used in Pav Bhaaji! And again, TOO SPICY. Sambhar and Chutney served alongside maybe the worst I have tasted alongside Dosa in Mumbai. This was no Dosa, ladies and gentlemen. It was a travesty. Had to leave it unfinished. -- WAFFLE UTTAPAM - Birthday boy had decided this looked good on menu and it did look nice. Another dish again with no overuse of cheese. 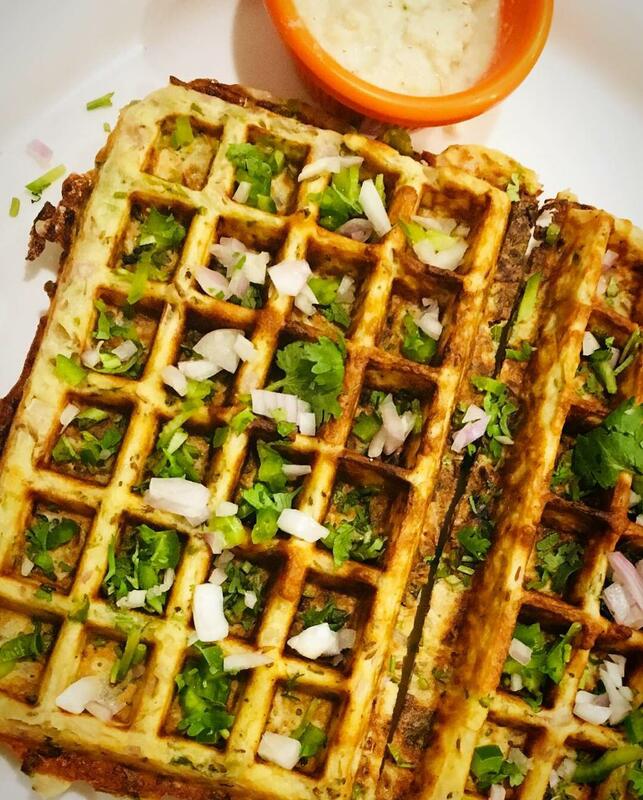 Basically uttapam made in waffle shape. Sprinkling of some veggies and cheese slivers on top made it taste decent. Again sambhar and chutney alongside was downright bad, something alien, not even remotely resembling what we get in udupi. But atleast uttapam was decent. Total damage for birthday boy less than Rs. 2000 and enough quantity for 8-9 people. What 5 Spice does for chinese food, this place does for cheesy stuff. Too much quantity. But quantity does not make us ignore the fact that basically this place is just a magnet for cheese lover. There is cheese in literally everything which also makes one full quickly. 2 bites and our brain started screaming 'enough cheese, have something else!' And when we had normal dosa-uttapam, it was not impressive. Also, we would like to suggest to the staff to let people know before ordering how huge the quantity is going to be. All around us we saw people unable to finish their food. Staff is polite and always keeps asking 'Did you not like it?" but the thing is, quantity is so huge and everything has SO SOOO SOOOO much cheese that nobody can finish anything! 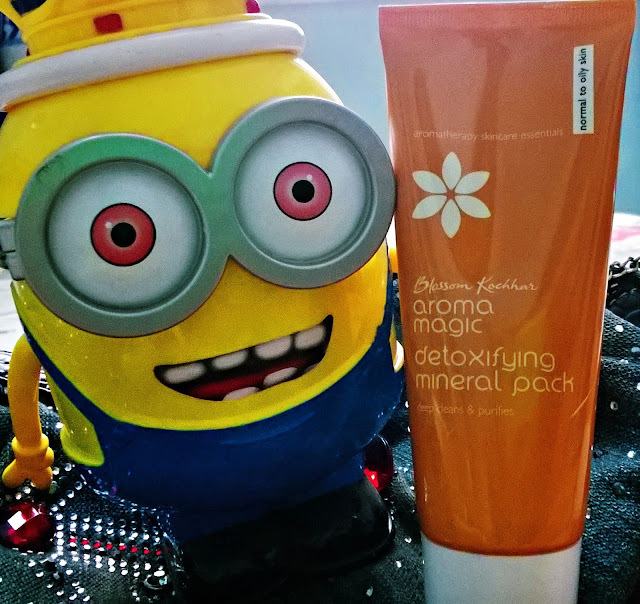 Packaging of Blossom Kochhar Aroma Magic Detoxifying Mineral Pack is very simple, sleek in a tube, hygienic, convenient to travel and store. Ingredients list is choc-a-bloc with amazing ingredients such as Vegetable Glycerin, Organic Mineral Salt, Rotorua Mud, Santalum Album Essential Oil, Green Zeolite Amargosa. I know it all sounds like chemistry class :P Basically it is a mix of minerals, clay, sandalwood and tea tree essential oils. NO paraben, NO harsh chemicals, NO alcohol, NO artificial fragrance and color, NO animal testing. BIG THUMBS-UP. Claims to deep clean, repair tired skin, heal , purify skin and enhance complexion naturally. It is meant for Normal to Oily skin types. Availability of Blossom Kochhar Aroma Magic Detoxifying Mineral Pack is common online on e-commerce sites such as Amazon and Nykaa. I bought it from Amazon for Rs. 395 for 100 grams. Quantity is good. I have been applying it twice a week for past 3 weeks and it still has enough to last 2 more weeks, so can be called value for money. Actually I use a thick layer so I may be using it up a bit faster, it may last even longer. Usage - Instructed to apply an even layer on face and neck, leave it for 15-20 minutes and then gently wipe off or rinse off with water. To be used twice a week for best results. Effect - As we see above, it does not claim any miracles. It simply says that the ingredients are detoxifying and they will deeply cleanse, purify and heal the skin. I would agree with the claims. As I said, I have been diligently applying it twice a week for past 3 weeks, so a total of 6 usages so far. My facial skin was filled with horrible acne marks and my skin in general had become a bit too oily in past couple of months. No idea why but my skin keeps changing every day it seems, more than the weather changes in Mumbai! Anyway, the first time I applied it on my face, it looked just like a regular sandalwood-turmeric paste. Like all aromatherapy products, it has a distinct smell but it is not chemical-y or strong. I find it quite soothing and herbal, a little bit like the old-timey vicco turmeric cream (again, due to sandalwood I think). Also, if you have any pimples, I think this pack would instantly reduce its size and redness, mainly because of its intense calming properties. Overall, I would suggest it as a must-have face pack especially for acne prone, congested, pimple-filled, oily and normal-oily/combination-oily skin types. Maybe a little bit on expensive side, it would be better to get 200 grams in this price. Recommended -YES! I am yet to be disappointed by an Aroma Magic product and this is no different. It fulfills all its claims and makes skin better naturally. I will repurchase for sure. Rating is 4.5/5. Punjab Grill, one of those places that need no introduction. The brand name that is synonym with elegance, royal hospitality and of course super-delicious food. Their new branch at BKC is no different. It is spacious, shimmers in golden hues, has comfortable seating options for couples as well as families, a vast menu with choicest Punjabi delicacies for veggies as well as non-veggies. Staff is constantly on their feet, nothing amiss in their hospitality. Even weekdays get packed so sometimes service can get really slow. But hey they also have LIVE music (at least they did last Friday) so that kept us entertained :D This was a review session but we stole a glance at their menu and prices are same as other branches, a bit on higher side, totally worth the complete experience here. -- Coffee Mocha Shake- My coffee addict sister liked it a lot, basic cold coffee with some cocoa element. -- Blueberry Frozen Margarita- My sister loves blueberry flavor and Margaritas, but she said this one was simple Blue Lagoon, not even remotely blueberry! -- Khumb Pudina Shorba- Light broth with distinct solid Mushroom flavor, but very little mint and a lot of pepper pods that made it strong. If you like mushrooms, go for it. --Paneer Multani Tikka- My absolute FAVORITE. Paneer in beautiful silky creamy marination, grilled in tandoor to perfection. So wholesome. -- Quinoa Methi Tikka- Healthy twist to Veg tikkas. LOVED it. Mildly spicy but delicious. Like all Tikkas, a bit dry, but went really well with accompanying mint dip/chutney. -- Malai Kofta- Soft Koftas filled with cottage cheese, dry fruits, cardamom, immersed in creamy saffron-y, fragrant gravy, garnished with pista. Another ROYAL classic. On sweeter side of course but not sugary at all. --Butter Naan and Zafrani Naan- Both were delicious, I personally like Butter Naan more but my mom liked the Zafrani Naan more, so it is about personal preference. -- Gulab Jamun- These were the mini versions. Were decent. I prefer the big gulab jamuns I have had here earlier, those are divine! -- Phirni- Good! Mildly sweet, creamy, well cooked, served chilled. Good for people like my sister and mom who do not have sweet tooth and just want something simple. On occasion of Navratri, Faasos has come up with royal meals with dishes specific to navratri fasting,ingredients such as sabudana, singhada etc. 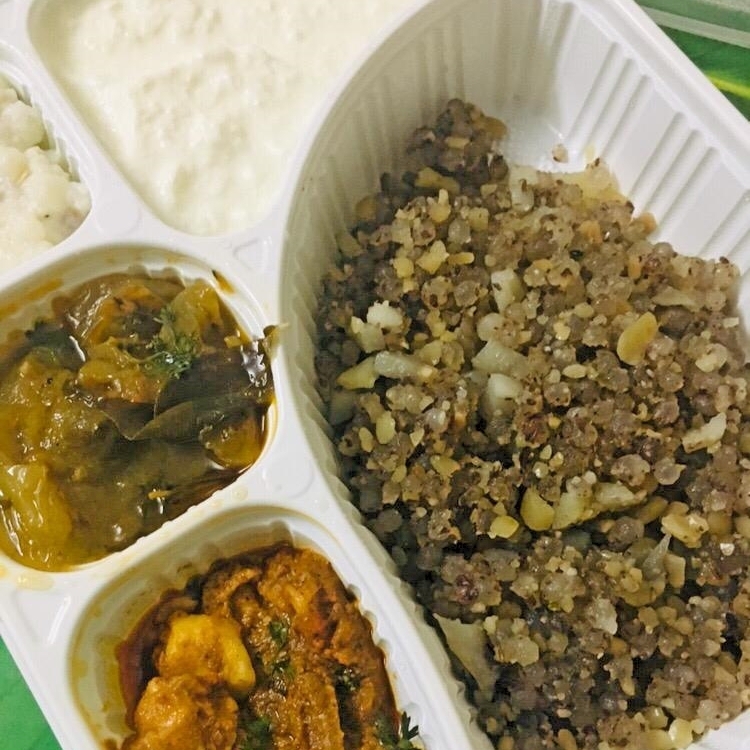 taking the centre stage after a year long binge feast of pizzas and pastas :D For this review session, I tried their Royal Sabudana Khichdi Meal PLUS Singhada Aloo Paratha Meal. As always, delivery was dot on time, packaging was beautiful and quantity of each meal perfect for 1 hungry person making it value for money. SABUDANA KHICHDI- Delicious wholesome healthy mix of Sabudana, peanuts, little bit of coconut too, loved it completely. But quantity could be more. It felt less. SINGHADA ALOO PARATHA - These were 5/5. Delicious, generous portion, aloo was uniformly stuffed, could have had these alone, perfect for navratri or after keeping a vrat. PANEER MAKHANWALA - Disappointing part of the meal for me. True to its name, it was paneer in makhani gravy but it had extreme amount of oil. It also had a predominantly tangy taste that I am not very fond of. The gravy is supposed to be rich (yes, even without using onions it is possible to make creamy rich gravy) but I basically found it tooooo oily and that was a turnoff. Paneer pieces and taste was decent. SABUDANA KHEER- Simple end to a fasting meal, just the way we make it at home. Loved it. Nothing hi-fi, just wholesome homely goodness. 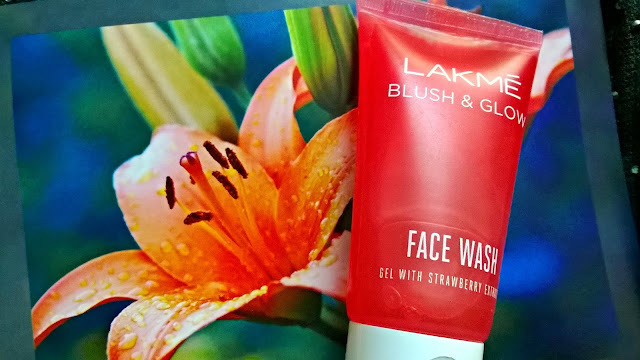 Lakme Blush & Glow Strawberry Gel Face Wash has been a popular staple among beauty bloggers for quite some time now. 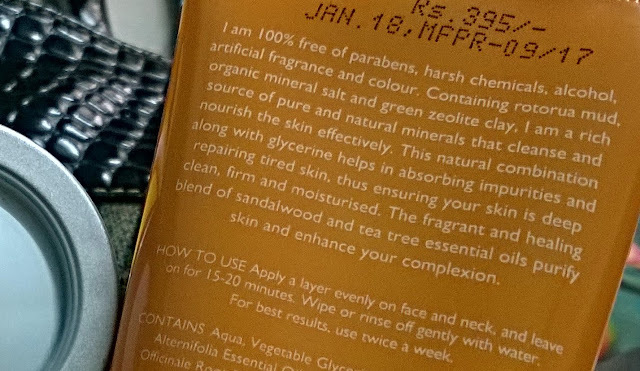 My sister knows my penchant for beauty products and gets me some surprise gifts from time to time, this was a part of a little gift hamper she got for me couple of months ago :) Let us see how this popular face wash fared on my skin! Packaging of Lakme Blush & Glow Strawberry Gel Face Wash is very simple, in a transparent tube. It looks nice with bright reddish-pinkish gel inside. The texture of tube is classy, doesn't look cheap at all. Ingredients list is a long whos-who of chemicals like most face washes (and definitely almost all products from Lakme). Strawberry Extracts is mentioned near the end. Well, cannot complain because they never complained to be a pure/ herbal/ ayurvedic/ natural/ eco-friendly/ exotic ingredients' laden brand. Claims to gently cleanse skin, wash away dirt and impurities while imparting a blush-like glow thanks to soft cleansing beads and strawberry anti-oxidants. Availability of Lakme Blush & Glow Strawberry Gel Face Wash is very common, it is available offline in almost all beauty products selling shops, stores like Big Bazaar, and ofcourse online on every shopping portal such as Amazon for Rs. 195 for 100 grams. My sister bought me this particular piece from Big Bazaar. Quantity is good, lasts a long time even when used twice everyday. This 50 gm tube lasted me and my sister a complete 1 month because we used it barely once a day for about a fortnight, later on we gave it to our dad who used it sporadically. Usage - Instructed to first take a small quantity on palm, work a rich lather and then gently massage on face, rinsing it thoroughly. Immediately rinse if it gets into eyes. 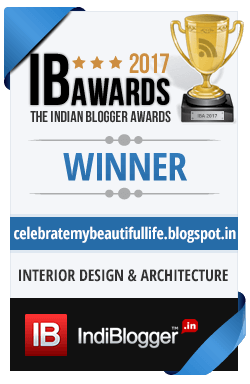 Effect - I remember more than a decade ago, I had just started experimenting with beauty products and my favorite face-wash used to be Strawberry face wash from Lakme. 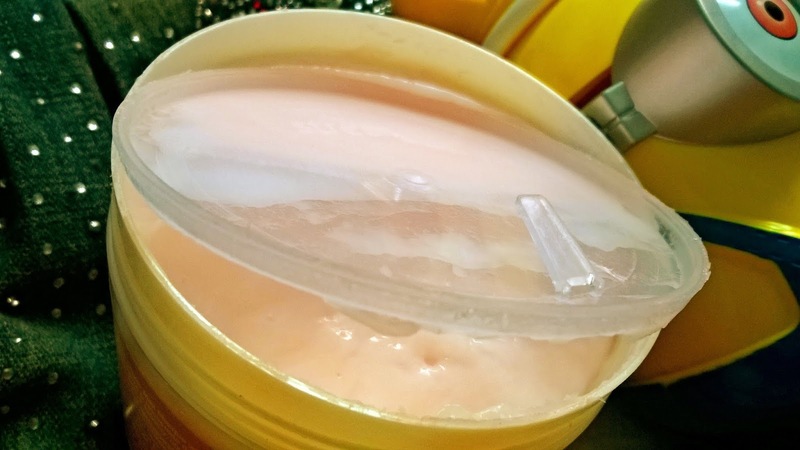 It used to have strawberry pulp kind of texture that used to really clean my face, refresh it and yet moisturize it. I used to look forward to come back home and melt away entire day's stress by using it! Back then I was not a blogger nor was social media so huge in our society else I would have recommended it everywhere. It used to smell so nice, fruity, just like strawberries too. So when I got this I thought the same product was back in a new avatar. But NO! It is completely different. This is not pulpy at all. It is a gel, has a more chemical-y feeling, it completely dries my skin, completely cleans all oil and makes my skin parched. It does deep cleaning but absolutely no glow at all. Very oily skinned people might find it better but combination skin, normal skin may find it drying and dry skinned beauties, please stay away. This will destroy your skin. It also has little beads that are probably supposed to lightly exfoliate skin but frankly they did not do any exfoliation on my face, they were very minute so no danger of scratching skin but at the same time I did not find any exfoliating effect. It did give a little tingly minty fresh feeling for couple of minutes. The only good thing I liked is that it did not increase pimples on my face or give any kind of breakouts/ acne/ allergies. 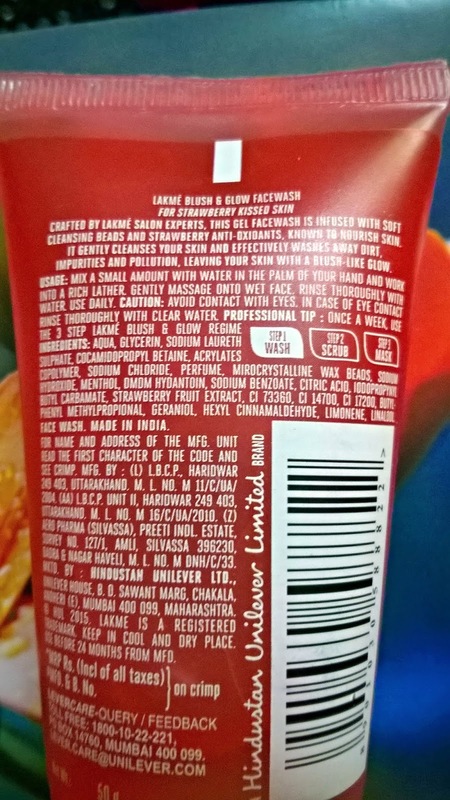 I miss the old Lakme strawberry facewash. Very easily available, offline as well as online. Recommended -NO! Oily skin people might like it but it made my skin parched like a desert. Rating is 2/5. 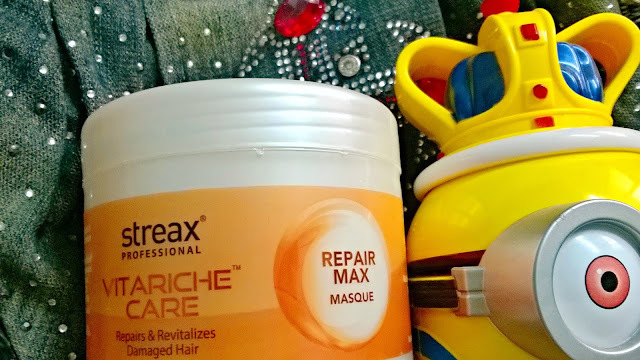 Streax Pro Nutri Care Repair Max Masque is the latest in a series of hair products I have used in the hope of making my unruly, horribly dry, dandruff-prone, itchiness-prone hair behave in a normal manner. Got it on a whim when I was browsing through amazon while twirling my fingers through my hair that felt like haystack. So just bought it and here is how it worked on my hair. Packaging of Streax Professional Vitariche Care Repair Max Masque is very simple, in a simple round jar. The colour of the mask itself is light pinkish/light orangish and it smells like any other commercial hair spa mask (basically it smells like a tub of fragrance chemicals). The jar looks secure enough to travel with. 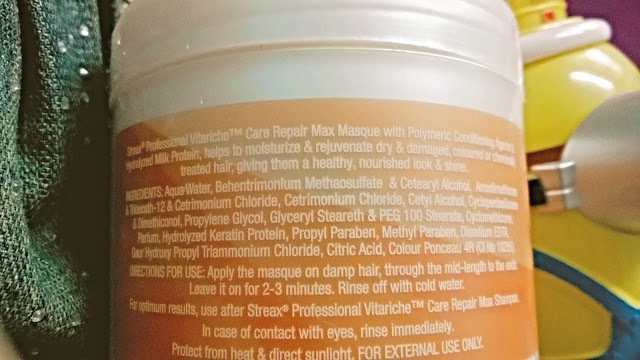 Ingredients list of Streax Pro Nutri Care Repair Max Masque is a long whos-who of chemicals, starting from Cetearyl Alcohol to Methyl Paraben and everything in between. I saw Hydrolyzed Keratin Protein in there alongside Citric Acid and those are the only two beneficial ingredients I can think of. Rest, I am sure is going to harm me in the long run, but honestly I have seen the alternatives and almost every brand has same ingredients in their formulations. This is the price we pay for convenience in our modern lifestyle. Claims to revitalize dry hair with the help of 'Polymeric Conditioning Agents and Milk Protein' and give a healthy nourished look + shine to damaged hair. Availability of Streax Pro Nutri Care Repair Max Masque is not very common, I have not seen it in stores like Big Bazaar, it is available online on sites such as Amazon for Rs. 275 for 200 grams. Quantity is decent, last for 1 and a half month on my thick, very frizzy, very dry hair when used twice a week. Basically lasted 12 washes on my hair, may last more on yours if your hair is thinner/shorter/less frizzy/less dry. Value for money for me. Usage - Instructed to use on hair from mid-length to ends (not on scalp) after shampooing while hair is still damp. Leave for 2-3 minutes and then rinse off. Also instructed to use it with shampoo from the same range but I honestly use my own favorite shampoo and keep changing conditioner/hair mask. I do not think it makes that much of a difference. 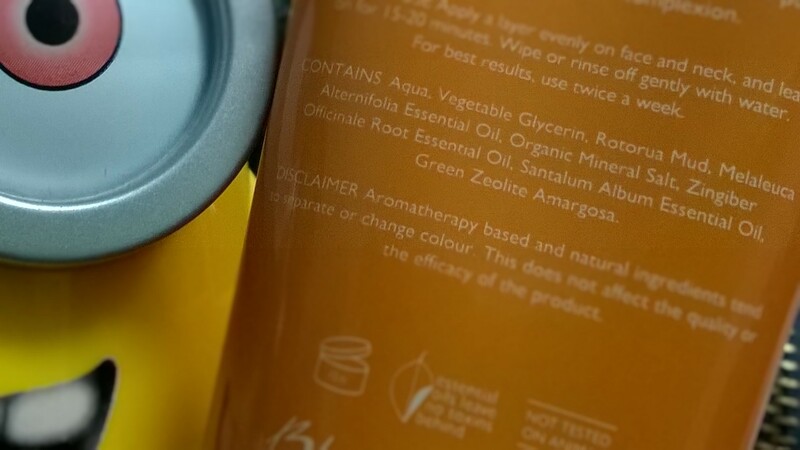 I believe that every product has its own individual unique ingredients that will work irrespective of any other product of the same brand is used or not. Effect - Every time I use a new product, I am very excited to see its results. Most of the time, I am not very disappointed but this time, I was. First of all, Streax Professional Vitariche Care Repair Max Masque looked good and smelled ok and I thought it will give same result as those hair spa masks in beauty salons. But it is a bit more liquid-y than a hair mask should be. On applying it, yes, my hair felt instantly smooth and soft and it also seemed to immediately clear all the tangles in my hair. I rinsed it off and air-dried my hair and it did feel good, but just for about a day. After 24-30 hours, my hair was again back to being super duper dry and frizzy. So for me, it was just a normal hair conditioner. I expect more from a hair masque. Moreover, I feel that after using this for 10 washes, I started noticing increased itching on my scalp. My scalp is naturally itchy, that is why I do not experiment much with shampoos or hair oils and I am not blaming Streax for my scalp problems. My scalp is riddled with dandruff, sensitivity and itchiness. But still I keep it under control most of the time by using my trusted combos of hair oils, essential oils and shampoos. I did get increased scalp itchiness couple of months ago and I cannot think of any other reason my scalp would itch (more than usual) other than this one new product that I started using at that time. Soon after I started noticing it, the product got over, and now my scalp is back to its normal level of itchiness. So I am definitely worried about that. Recommended -NO! Apart from the fact that Streax Professional Vitariche Care Repair Max Masque did nothing extraordinary for my hair, I suspect it increased itchiness on my sensitive, itchy scalp. Rating is 2.5/5.